Pleaded guilty: Carol Ackels makes an outburst Thursday in Ingham County Circuit Court as she sits next to her attorney, Gene Turnwald. Ackels was sentenced in the shooting death of her daughter Sarina Ganser in July in south Lansing. A Lansing woman who killed her own daughter blamed everyone but herself in a fit of rage Thursday before learning she'll spend the next 42 years in prison. Ingham County Circuit Judge James Giddings doubled the recommended sentencing guidelines, saying Carol Ackels lied repeatedly during the investigation of the shooting July 24, denied responsibility for her actions and violated Sarina Ganser's personal protection order. Most importantly, the judge said, Ackels went outside Ganser's home with self-inflicted gunshot wounds and failed to tell police she had shot Ganser. Because Ackels was misleading, investigators treated Ganser like a criminal, taking 22 minutes to secure the home. They handcuffed Ganser before they helped her. Meanwhile Ganser, 22, bled to death. "She might well be alive today - this daughter you say you miss so terribly," Giddings said. As Giddings announced the 40- to 60-year second-degree murder sentence, plus two years for using a gun during a felony, the courtroom exploded with cheers and clapping. The sentencing guidelines had called for 12 to 20 years in prison. Giddings warned the people in the courtroom to contain their emotions. "It won't bring her back," he said. "She's gone. This isn't a time for celebration." Ackels, 40, pleaded guilty to second-degree murder and the felony firearms charge in May. Police believe she shot Ganser four times, then turned the gun on herself. She sustained two gunshot wounds. It was earlier thought Ganser was shot twice. The shooting was two days before Ganser and Ackels were scheduled to attend a hearing to evict Ackels from Ganser's Stabler Street home. In a rambling, tearful tirade, Ackels told the judge it was Ganser who shot her because she had been torn between her parents. Ackels said she tried to grab the gun and didn't remember it going off in her hands. She said Ganser's father, Peter Ganser, urged their daughter to get a personal protection order against her. "I miss my daughter like crazy. I don't know why God didn't take me," Ackels said. "I'm ready to go to prison. I don't care. I lived for my daughter." Ackels looked scornful and interrupted Peter Ganser as he addressed the court. She said he wasn't around for the first 20 years of their daughter's life. Peter Ganser said he wished the death penalty could be imposed for Ackels. He said his daughter had made him proud with a career as a hair sty-list and having her own home and car by the time she was 22. "It's a sad and horrible case," Ackels' lawyer, Gene Turnwald, said. "Hopefully this will bring some closure to both sides of the family." Ingham County Chief Trial Attorney Mike Ferency, who asked for 15 more years than the sentencing guidelines, was pleased with the sentence. Ackels "was stunning in her selfishness and own neglect of her role in the death of her daughter," Ferency said. "She blamed everyone but herself." Ingham County Circuit Judge Thomas Brown said sentencing guidelines are set by a state Supreme Court committee. Brown, a judge for more than 20 years, said he has exceeded the guidelines but has never doubled them. He said Giddings' move was uncommon. "Sentencing guidelines don't always reflect the facts of the case," Brown said. Ganser's grandmother Elfriede Ganser-Stock said she was relieved by the sentence. "It will never bring her back, but we have justice," she said. After the sentencing, Ganser's family gathered at her grave. "We want her to know we were fighting for her," Ganser-Stock said. Ackels' sister Bernadette Doebler said she and Ackels' family have been grieving since Ganser's death and Ackels' arrest. "You can't deny her actions," Doebler, of Lansing, said of her sister. 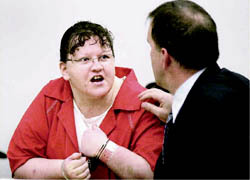 Doebler said Ackels suffered depression and agoraphobia, a fear of public places, and was on the antidepressant Paxil. A month before the shooting, Ackels and Ganser's fighting intensified and doctors increased Ackels' dosage, Doebler said. "She told me, 'All I want to do is die,' " Doebler said. Contact Kara Richardson at 267-1301 or krichard@lsj.com.